What to expect from a Chinese wedding? Weddings are a wonderful occasion where two families unite through the mutual love of two people. You might be wondering why we choose this time to talk about Chinese traditions of wedding, I’ll tell you why! Because summer is what I call ‘Wedding mania’, where I turn into the main protagonist of ’27 dresses’ and have 2 weddings to go to in one day. You might find yourself thinking, why don’t you refuse? I could but there’s something you need to bear in mind. In China being invited to someone’s wedding as a guest is a great honor. It signifies you are close friends and there is a hidden understanding that you are building a connection for the future as the couple inviting you are expected to automatically be invited to your wedding in the future. So it’s a loss of face and seen as extremely rude not to attend. But don’t worry there’s a ‘get out of jail free’ card for this that involves another hidden wedding tradition. 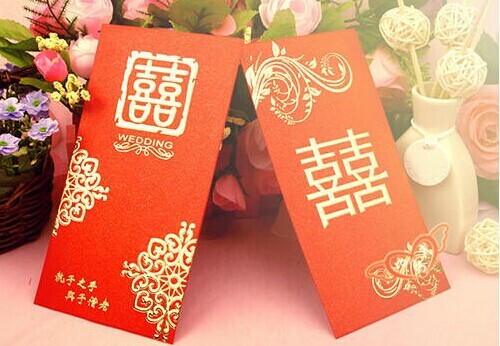 In China, guest do not give gifts and the happy couple do not make a registry gift list like we do at home, instead cash in the form of red envelopes or Hongbao is expected. If you cannot make it to someone’s wedding a good way not to offend the couple is to still give a hongbao. Hongbao’s are serious business and one of the couples’ parents will record how much money is given by who in a book so that in the future the couple may gift the same amount back so that no money is lost. 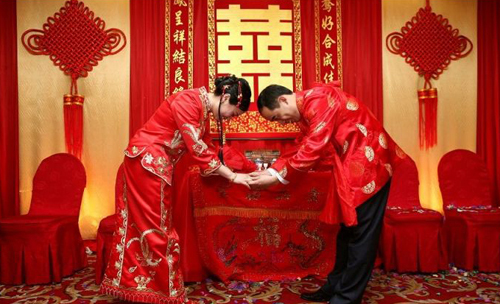 Apart from hongbaos most wedding traditions in China have changed and become more westernized. Although you might not agree when it comes to Chinese wedding decorations and games. 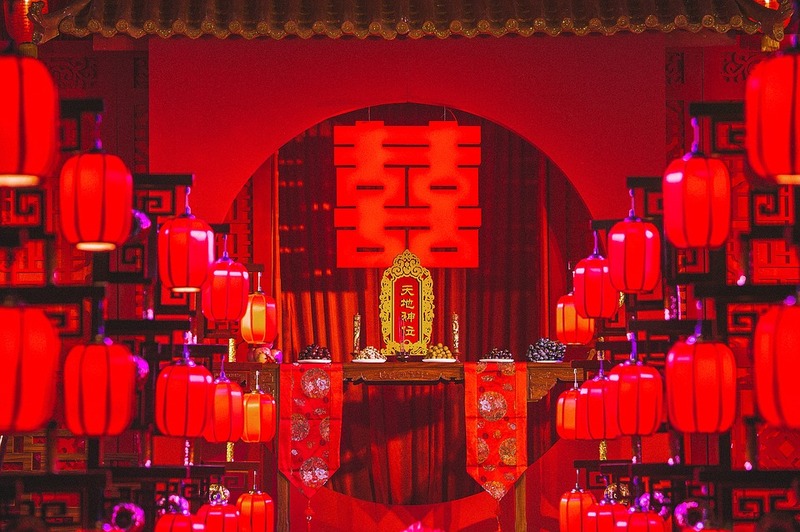 In China, the color red has positive connotations so it is seen as a lucky thing for the bride to wear red and for the decorations to be based on this color. However, most brides choose to break down their wedding into two ceremonies so that they can forego wearing a traditional red dress and wear a beautiful white dress. It’s the best of the both worlds, two stunning dresses in one day! For the ceremony itself, it’s a mix of old and new. The wedding is normally run by an MC. This is often officiated by someone who is famous or a close friend of the couple, they are the ones that introduce different events and officiate the wedding. I should point out that in China you need to register your marriage at the local government bureau who will give you a red marriage booklet, so by the time the wedding comes around the couple has already been legally married. So the wedding is more like an elaborate show of the couples love. But the MC isn’t the only one that helps run the wedding, the best man and bridesmaid (who must be single), an adopted western tradition, will also have their own games at the ready. These involve not letting the groom see the bride, banging the couples head together, and so on. The wedding usually finishes with lots of fireworks and a copious amount of food. 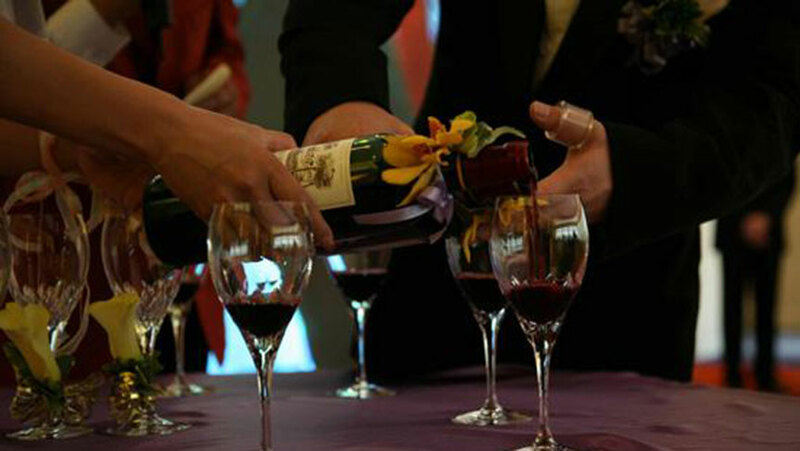 The couple will spend that time going from table to table toasting with each guest as a sign of respect. This takes a lot of strength as it involves shots of Chinese wine with a 50% and above alcohol percentage. After reading this you might find yourself catching your breath. Well, sorry to tell you but this isn’t the end of it. You need to take into account that these weddings can take a year of preparation, sometimes longer. The first step starts with the photos. 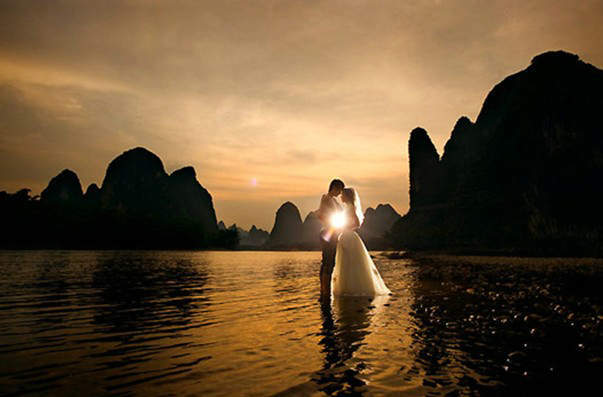 Unlike in the west where a photographer will make guests pose and then will take photos through the wedding, in China photos are taken beforehand by just the couple. This is to ensure that you have a good picture, these photos can even be used as wedding invitations. In China, it’s not seen as bad luck to see your brides dress beforehand! What started as a fun idea to get good pictures with your dress, has turned into a crazy wedding industry. Couples happily pay extortionate amounts of money to go abroad to take wedding pictures in places like Paris! On top of this, most wedding photographers are too intense with Photoshop, so that by the end of the photo editing you might not even recognize your friends in the picture! One thing you need remember is that in China people prepare for their kids wedding from the moment they are born, it’s just expected you will get married, so weddings will be over the top and extravagant. Everyone wants to have the most talked about wedding. This means they might hire crazy expensive cars like a set of Lamborghinis to take their guest to the wedding, have famous stars sing at their weddings, or even rent out whole islands for just a wedding! As a guest, you get to enjoy all of this. Although it has gotten a bit extreme when you peel away at the Photoshop over the top layers and get to the foundation of Chinese weddings, they are still all about love and the bridges that will be built between two families.